Today I painted five onesies for the ANF Bazaar next weekend. 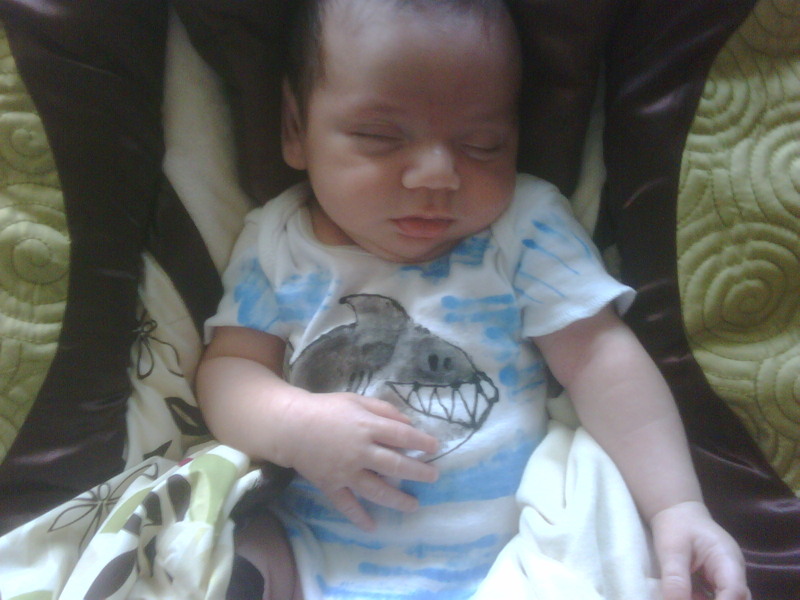 The owl is a new onesie design while the rosette and shark are two of my favorites. I'm going to get 15 more made by next Saturday--- and I'll love to hear your ideas on what to put on them. He asked her, "Are you ready?" and she coyly said to him, "I was born ready." The space is really big and will house not just art but beautiful vintage clothes. Another great part about the space is that it is literally right across the street from Photo Miami. Which was a really good show last year. Our galler y space will be open starting on Tuesday 11am-8pm and Sunday 11am-6pm. I hope you'll come and support --- or help us spread the word. Here are some pictures of my wall in the gallery. I hung it not only by myself (so proud) but without the help of a level (uber proud). As I was leaving my friend's mom (who is in charge of sales) was asking me if she needed any details on my work. I gave her some information and said, "I'll pick it up on Sunday." her response was, "Hopefully you won't have to"... wouldn't that be nice? Art Basel is a pretty big deal in Miami. 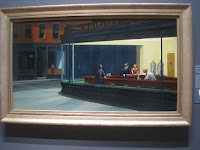 In recent years, smaller art shows have piggybacked on the big shows momentum and moved their dates to coincide at the same time---which means that art lovers and collectors are out looking and enjoying. Today, I was invited by a friend to set up shop in a small space she is taking over across from Photo Miami for Art Basel week, (3302 North Miami Avenue). My friend Sheffield will be selling her gorgeous vintage clothes and accessories which you can pre-check on her site, Back-in-Style. There will be other artists showing and the Windischunt Gallery of Coconut Grove in Sheffield's Gallery during Art Basel week. I am so excited because I had no intentions of showing, and now December is turning out to be a very busy month with the Art Basel showing (Tues. Dec. 1-Sun. 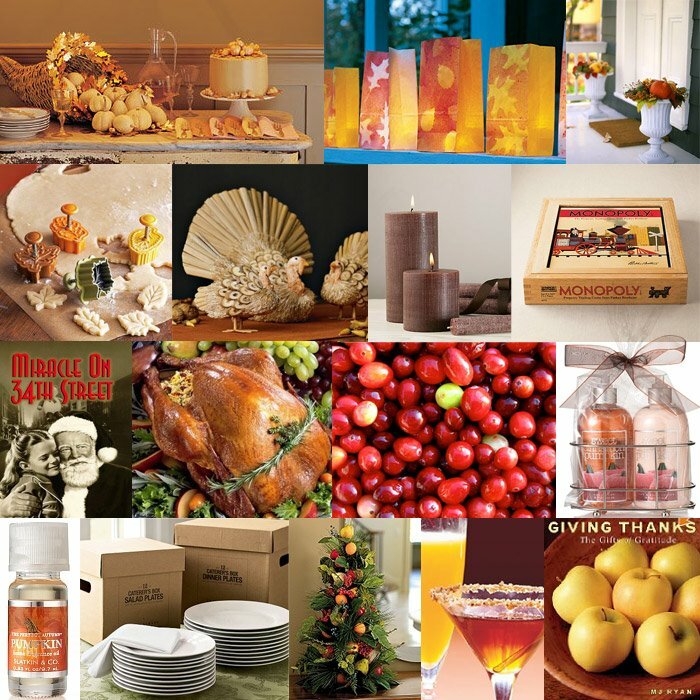 Dec.6) , the ANF Bazaar on Key Biscayne (Saturday Dec. 12) and the one night sale at Eanie Meanie on Miami Beach (Wednesday Dec. 16). So I hope you will come out and support at any or all of the events. If you can't make it, help me spread the word---mention the events on twitter, blog or facebook and let me know so I can enter you into the end of the year drawing. Happy Thanksgiving! May it be filled with good friends & family, good food and good floats! Meet Carlos, one of my beautifully handsome models recently born in October. Carlos is showing off his 11 pound physique in his handmade Shark onesie made by moi. As you can see, the onesie is comfortable while stylish. I'll have about 20 onesies on hand at the bazaar I'm attending next month. I'm also happily taken orders for onesies. Last night I started work on Julia's "J". I wanted to do a monogram for her--- but mom requested a "J" to match sister Olivia's "O". The girls are the subject of a blog, The Kauffman Chronicles . Two very sweet and adorable girls who happen to be my nieces and one my goddaughter. Anyhow-- with the Holiday Bazaar on Key Biscayne and my one night sale at Eanie Meanie on Miami Beach, it's time for me to crank out my gifts for the newest girls and boy in my life. They will probably end up being Christmas gifts --- we'll see. Time to put paint on canvas. So I found the fabric marker--- and finished the bag. Thank you everyone who chimed in and has enjoyed this new product to the cSd line. I'm happy to take orders--- just email me. I'm going to use this for work this week and see how it holds up--- I expect it should do beautifully. I'm going to make a few bags for the Bazaar next month. This one is a nice size good for groceries, toting things around for yourself, the kids--- to school...all sorts of things! My friend Robin has already put in a request for her own monogrammed Texas heart bag. She's a events planner so I know that the bag will be taken here, there and everywhere holding everything from seating charts to sign-in sheets. I may get a small one to make for my niece Olivia--- hers would have her monogram and a mermaid probably. Anyhow-- stay tuned for more bags. Last night I know that I posted the beginning if the bag project. Tonight I wanted to show the progress of the bag. This is an experiment. I know it needs work... does anyone have recommendations for a good fabric pen? The black paint isn't working well for my signature outlines. the other side. That's why I went with the signature Texas flag in honor of SMU. The bottom of the bag is striped in SMU colors. I'm thinking of doing a red band across the top---but not sure...I also still need to outline the heart--- but I don't want to do that until I find the right fabric pen. So there is my work in progress. So tonight I started working on a new project. This is the first bag I've done--- so I'm making it for myself as a prototype. I'll do the other side too, I just have to wait for the paint to dry--- and I may do things on the sides... stripes or something. I am really excited to see where these reusable shopping bag go as far as designs can go. Today I signed up for my first bazaar--- Saturday December 12 on Key Biscayne. I'll sell original art, onesies, T-Shirts and be taking orders for everything including bags. I'm also going to try and have prints ready for the sale. We'll see. ---but what do you think?? ...also it's not too late to tell me what to draw for a chance to win your suggestion on canvas! 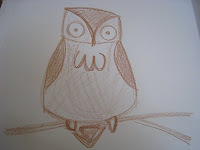 I've been captivated by the wise old owl as of late. 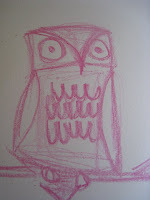 I'm pretty sure as soon as I am done with commissioned work, that the next painting I will work on will be of an owl. Thank you to those of you who commented back on the last blog entry. 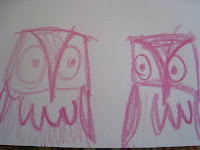 My friend J said she really liked the owl---so I thought I would post the owls that I drew that night and the finished owl that I posted earlier. 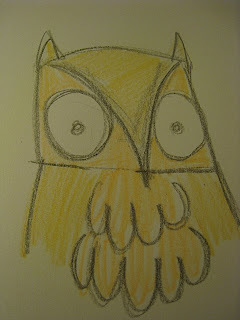 I think I am enjoying the owl because I can imagine the conversations my anthropomorphised creatures would have. Take for instance the two pink ones... I call that sketch, "Two Owls Walked Into a Bar"
"Hey Phil, you look like you you ate something funny"
and then the other owl would say, "Yeah, I had the other half of that mouse you left behind"
Anyhow---its not too late to tell me what to draw for a chance to win your suggestion on canvas! Spread the word and tell your friends. 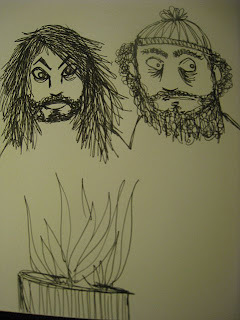 Eddie told me to draw something dark..."like some homeless guys standing over a garbage can fire" ... well Eddie there you have them. 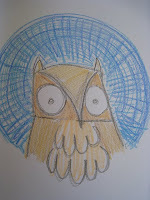 Someone else asked me to draw my school mascot (off the record)... so here is an owl--- the mascot of Bank Street College. You told me what to draw and I enjoyed the challenge. Now it's time to tell me again! I will put all submissions into a drawing and the winner will get a mini-original painting of their request!! So tell your friends to tell me what to draw and thanks for those of you who did! This weekend was all about good food, good friends and the good art that comes from it. Friday night was a lovely home cooked meal at our friends the Knights-- Saturday night we went to B&B (Burger & Beer Joint) on Miami Beach-- it was fun. A little loud but the food was great! As I am trying to eat healthier again, I had a turkey burger, which as you can imagine was dry---but D's burger looked fantastic and he said it was. Sunday night we went to good old Versailles for Cuban with friends from in and out of town that we had not seen in a very long time. So it was a good food weekend. From this weekend also came good art. Over dinner last night-- I drew this portrait of our groupette. D, Chris, Ana and myself. The four of us out on South Beach for the Sleepless Night events which made for a great adventure. 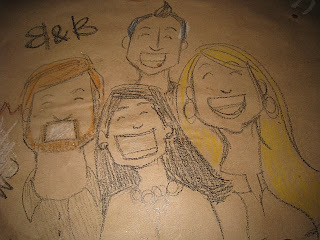 So there you have it--- good food + good friends + good art = good times! 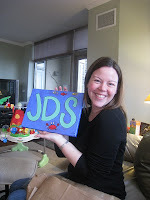 My last blog entry was showing off sweet baby James' painting I was working on to bring with me to Chicago. Last Friday I went to visit Meghanne and James (who is adorable beyond belief) in their beautiful home overlooking the Navy Pier. Here is mama Meghanne very happy with the painting for Jame-o's room. The rest of the trip was fantastic. 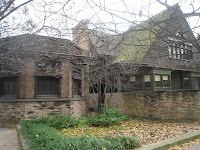 I finally got to Oak Park to see some of Frank Lloyd Wright's earliest work which was fantastic--- and I also finally got to see Seurat's An Afternoon on the Grande Jatte and Hopper's Nighthawks. Good times, great friends, great food! 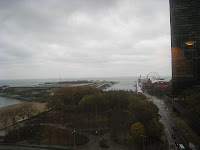 Over all...Chicago is on my list of places to visit over and over again!